Even though January always seems to last 873 days, Valentine's Day still manages to sneak up on me. I don't actually mind the month of January, since my daughter and I both have birthdays in January and it's good to get back into a routine after the holidays. But it still seems like a long month! I've been LOVING putting together these fine motor packs! I just added my 14th pack which is funny because it's a Valentine's Day pack (get it - February 14th? :)) I know that many of my readers like being able to see all of the activities laid out in a blog post, so I'll share about the pack today. 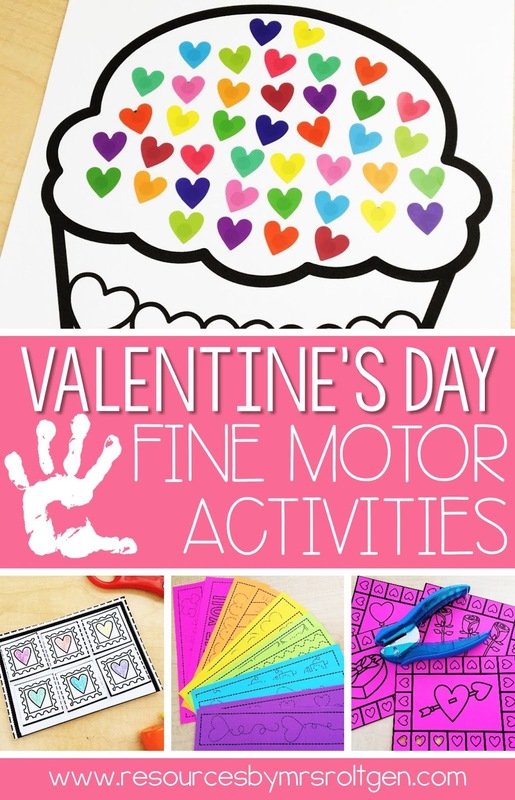 Here are the ten Valentine's Day activities! With many of my activities, there are tons of ways you could use them. You could use this as a paper tearing activity by providing construction paper strips for students to tear and glue. Or, you can do a "snipping" activity where students use scissors to snip the squares on the strips I designed. I usually include multiple cutting activities in my fine motor packs. 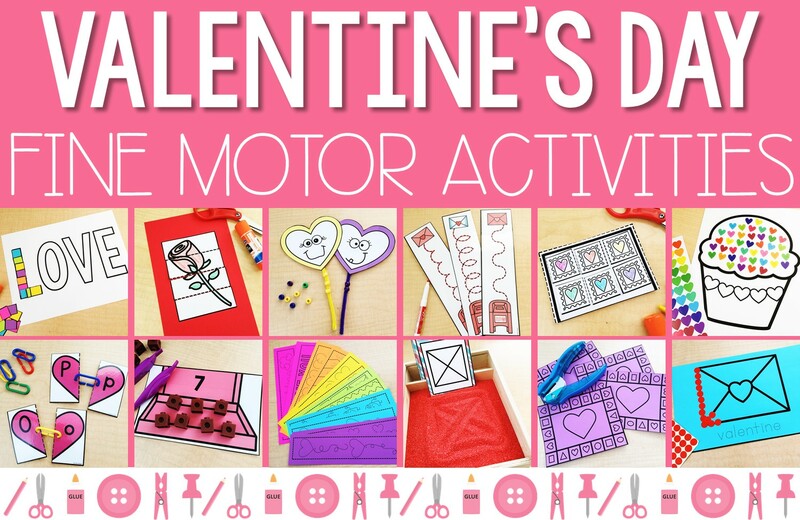 In this pack, there is a Valentine stamps cutting activity, puzzles, and Valentine's Day trace-and-cut bracelets. I love activities that have children cover up small dots. You can use stickers or small objects like buttons. Here are the heart stickers I have. They're high-quality and the pack comes with 36 sheets!! In this activity, students will fill boxes of chocolate by counting or adding. There are mats with numbers to 10 and there are also mats with addition within 5. You can use cubes, pom-pom balls, or any other small objects. You could even use real chocolates! :) I use these jumbo tweezers. There are simpler lines with designated starting points and there are also pictures, which are more difficult. Choose the cards most suitable to your students' needs. Here's what I use for the tray, and I have this multi-pack of sand and I love it! These cards have lines that progress in difficulty. Again, you can choose which cards best fit your students' needs. Students will match uppercase and lowercase letters and link the cards together. Students will string beads onto pipe cleaners. If you don't want to use beads, you can use these as color-sorting cards and have students tweeze pom-pom balls onto them. There are two versions of the cards. On the first set, students will punch all of the hearts. On the second set, students will punch only on the hearts, not the other shapes. I use a reduced-effort hole punch because I've found that the standard ones can be too difficult for young kids. This is the one I have and it's held up great for several years. 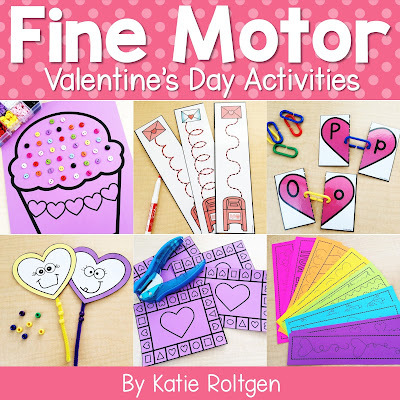 For this activity, students will use small stickers or dot markers to outline the pictures. They can also trace the word. I talk about these dot stickers all of the time and they're perfect for activities like this! If you have any questions about these activities, please let me know! To grab the pack on TpT, click on the image below. 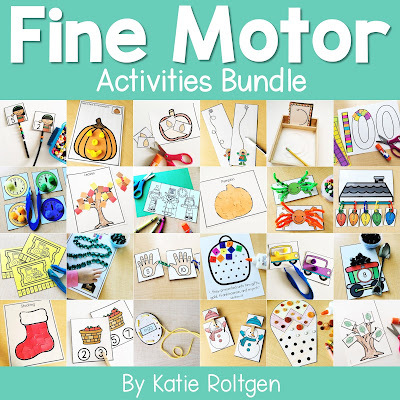 Click on the bundle image to check out the discounted fine motor bundle.